Some clouds. Low 64F. Winds SW at 5 to 10 mph. Lake Placid’s Patrick Healy slides safely under the tag of Avon Park third baseman Andrew McGuckin during Tuesday night’s game. Avon Park’s Cory Leech celebrates as he approaches home after hitting a two-run home run in Tuesday night’s win against Lake Placid. Lake Placid’s Briar Napier tags out Avon Park’s Cory Leech at third base during Tuesday night’s game. The Red Devils eased past the Green Dragons 12-2. Avon Park’s Cory Leech tries to tag out Lake Placid’s Patrick Healy during Tuesday’s game. LAKE PLACID – On a cool, windy night the Lake Placid Green Dragons hosted their long time rivals the Avon Park Red Devils on the diamond. The Red Devils eased past the Green Dragons by a final score of 12-2. The win improved Avon Park to 4-1, while Lake Placid dropped to 0-3. 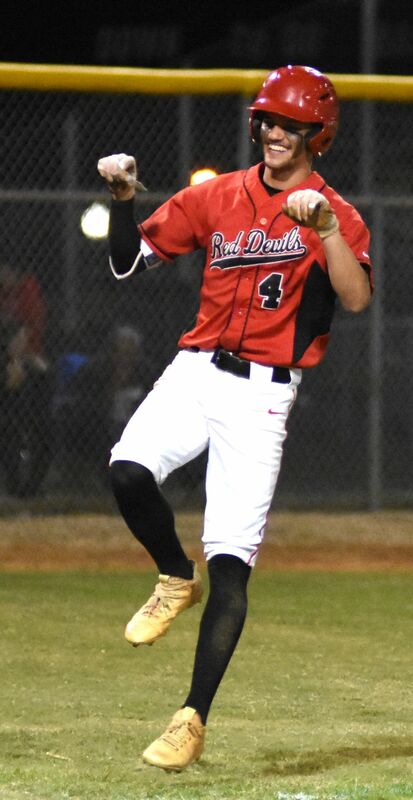 In the top of the first inning, Avon Park’s Cory Leech was on first when Trent Lewis stepped to the plate and hammered the ball over the right-centerfield fence for a two-run homer to put the Red Devils on top 2-0. Avon Park extended its lead in the top of the second. Mason Huertas was on first when Hunter Vanderpool rocketed the ball over the left-centerfield fence. Dawson Bryant drew a walk, stole second and took third on a wild pitch. Terry lofted a sacrifice fly to centerfield driving home Bryant to make it 5-0. Lake Placid cut the deficit in the bottom of the second. Patrick Healy hit a grounder to shortstop and beat the throw to first. Healy stole second, then third and raced home on a passed ball to make it 5-1. Avon Park answered in the top of the third with a solo homer to give the Red Devils a 6-1 lead. The Green Dragons narrowed the deficit once again in the bottom of the inning. Briar Napier and Jorje Martinez each drew walks. Napier took off for third and Avon Park’s catcher, Matt Tyson, threw to third but missed his target. Napier made it safely home on the error chopping the deficit to 6-2. In the top of the fourth, Vanderpool drew a walk and Leech drilled a homer down the right-field line to make it 8-2. The Red Devils escalated their lead once again in the top of the fifth. Andrew McGuckin doubled, Tyson singled with McGuckin moving to third. Kevin Myers came into run for Avon Park’s catcher. Myers took off for second and Lake Placid’s catcher, Shamar Mitchell, threw down to second but overthrew and McGuckin ran home on the error and Myers advanced to third. Huertas hit a pop up into right field that dropped driving home Myers for an RBI double broadening Avon Park’s lead to 10-2. Avon Park enhanced it’s lead in the top of the sixth. With the bases loaded, Tyson doubled in two runs to give the Red Devils a 12-2 lead. The Red Devils retired the side in the bottom of the inning to end the game. Lake Placid hosts the Frostproof Bulldogs tonight at 7 p.m. The Green Dragons will host Class 5A-District 12 rival Lemon Bay on Friday night.